As many as 60 types of oaks grow native to North America, with 41 species attaining tree form, states “Trees of North America.” The typical oak features alternate leaves, with the foliage usually large and growing one to a node on twigs and branches. 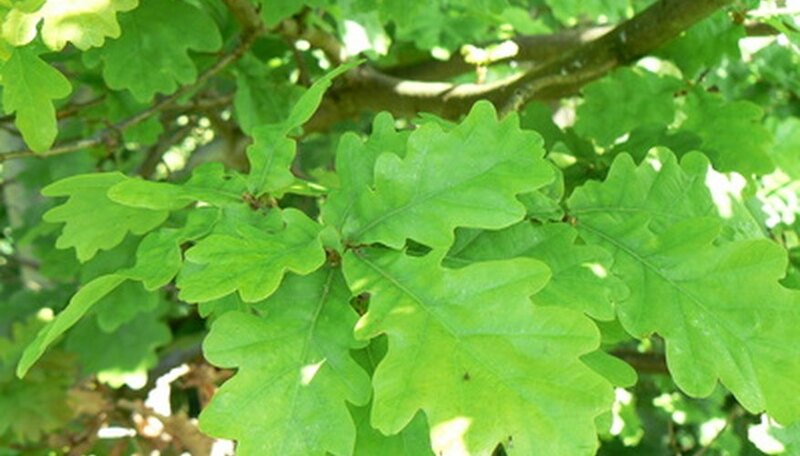 Oaks have unisexual flowers known as catkins and produce a fruit resembling a nut called an acorn. To tell the oaks apart, you must focus attention to the shapes, colors and sizes of an array of aspects. Distinguish the shape of the oak leaf. Most oaks will have leaves that either have rounded lobes or pointed lobes, with the pointed-lobed leaves possessing tiny bristles on their tips. The rounded lobes belong to a group of oaks called white oaks, while the bristle-tipped pointed-lobed leaves highlight the red oak group. Look for oak leaves from the white and red oak groups with irregular shapes that do not fit into the lobed or pointed-leaf categories. The chestnut oaks of the white oak group have oblong leaves with serrated edges. Oaks of the red oak division, such as willow oak, have narrow smooth-edged leaves. The live oaks, which are also part of the red oak family and retain their leaves through the winter months, have thick elliptical leaves, with some species owning leaves that have the shape of holly. Estimate the tree height when trying to classify an oak species. Some can grow to exceed 100 feet; white oak and overcup oak are two types that grow this high. Others are medium in size, such as northern red oak and chinkapin oak, with maximum heights in the 70 to 80 foot range. Other oaks, especially the live oaks, are in the 40 to 60 foot range with a spreading crown of branches. Several oak species grow to barely 20 or 30 feet, with the blackjack oak, turkey oak and bear oak in that class. 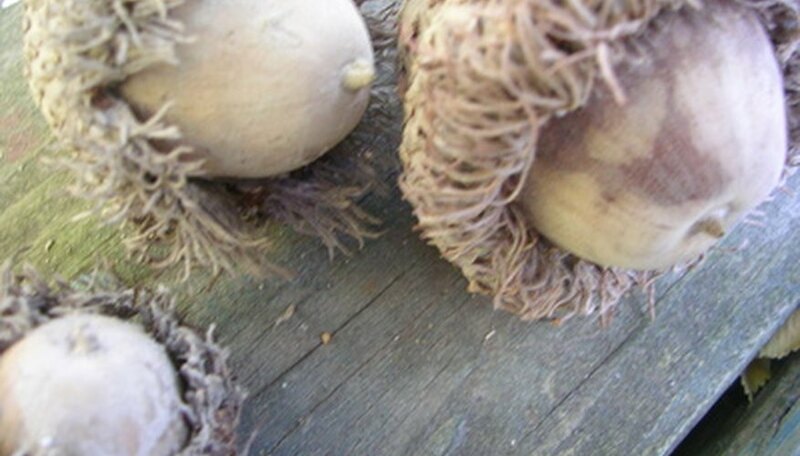 Compare the acorns of oaks, looking at their lengths and their caps—the small cup-like growth that covers the top of the fruit and attaches it to the twigs. You will quickly recognize a bur oak, for instance, by noticing a rough frilly cap encompasses almost the entire fruit. The overcup oak’s acorn has a tough scaly cap that surrounds its whole body. The acorn of a swamp chestnut oak has a length of about 1-1/2 inches, with the cap going a third of the way down the acorn. Study the acorns that are still on the oak tree to gain insight into whether an oak is a red oak or white oak, which helps you with your oak species identification. Look for acorns of different sizes on the same tree, which indicates an oak is part of the red oak family. Their acorns require two years to fully mature, resulting in the older larger acorns still hanging onto the branches as the first-year acorns develop. The white oak’s acorns need only one growing season to mature before they fall off. Inspect the bark of the oak tree, keeping such characteristics as color and texture in mind. The red oaks most often have a furrowed and deeply ridged gray to brown-gray bark. The white oaks will have a more scaly bark with a light grayish complexion.